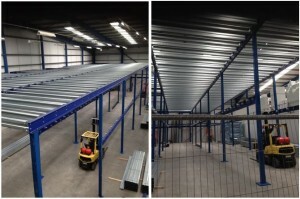 Storage Concepts have nearly completed the construction of a very large two tier mezzanine floor in Leicester. The fire rating, shelving, lights and goods lift will be installed soon. If you are interested in making the most of any wasted space in your company’s facilities, then look no further than our quality mezzanine floors. Mezzanine floors are the best way to increase your storage capacity. If you would like to find out more about the mezzanine floors we offer, please go to the ‘Storage Concepts – Mezzanine Floors’ tab on our website.